Shear strength of rock discontinuities (e.g., joints, bedding planes, shear planes, faults, etc.) plays a crucial role in controlling the rock mass behavior particularly at shallow depth where chances of intact rock failure are minimal because of low stresses (Hoek 2007). 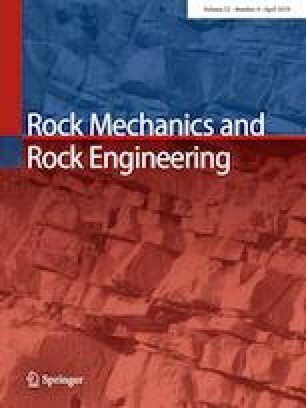 A number of researchers investigated the influence of various factors like joint roughness coefficient (JRC), joint compressive strength (JCS), magnitude of normal stress, stiffness of surrounding rock mass, rate of shearing, nature and thickness of infilling material, and degree of saturation on shear behavior of rock discontinuities (e.g., Barton and Choubey 1977; Kulatilake et al. 1995; Grasselli and Egger 2003; Hencher and Richards 2015; Singh and Basu 2016, 2018; Tang and Wong 2016; etc.). The authors are thankful to Prof. Giovanni Barla for his suggestions that helped improve the readability of the article. B. K. Ram acknowledges research fellowship from UGC, Government of India. The authors acknowledge the overall support by IIT Kharagpur for carrying out this investigation.